Hi, all! 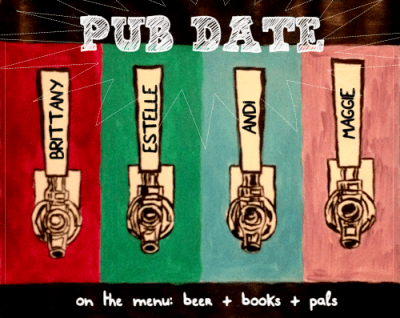 Welcome to back to our feature called PUB DATE where Estelle from Rather Be Reading, Andi from Andi’s ABCs, and Maggie from Just a Couple More Pages and I all team up to pair books + beers in harmony! Each week, one of us will features a beer and a book of our choice, each with a different theme for that month! I wish I could say the drink I was featuring today was metheglin, a mead featured in the book. I’d love to make a bookish drink when homebrewing someday but I’ve never made a mead before. I’d really love to taste something like it because it sounds absolutely amazing! It’s definitely on my list of things I’d love to brew someday and I’ve dreamed about making a drink from a book but since I read a lot of YA, it’s not like there are too many beers out there, ya know? But hey, that’s what adult fantasy is for and that’s what THE NAME OF THE WIND has me craving! The awesome thing is that Patrick Rothfuss even wrote up a whoooole blog post about the making of this magical mead including ingredients (!!!) but honestly there are a whole ton of them so that’s another reason why I haven’t made a valiant attempt on producing this yet! It is my dream someday though so my future batch of metheglin is today’s brew of choice. (Cheating, I know.) Cheers! Anti-Hero IPA by Revolution Brewing Company. American IPA // 6.5% ABV. IPAs have really been growing on me and Revolution has some pretty amazing beers. Anti-Hero is one of their flagships and it’s always top-notch. Salted Caramel Brownie Brown Ale by New Belgium Brewing Company. Brown Ale // 6.30% ABV. I will absolutely admit that I bought this sampler back because of this beer. I was super intrigued. At first sip, it just tasted like a brown ale but the more I drank, the more I tasted that chocolate coming through! Lavender Wit by Penrose Brewing Company. Witbier // 6.20% ABV. Penrose is a local brewery and I just love their beer. You could definitely taste the lavender here and it was weird to have such a floral taste (well, for me personally — I’m not too much of a floral person) but it was light and delicious! This entry was posted in Books, Pub Date and tagged Beer, Books, Music, Patrick Rothfuss, Pub Date, The Name of the Wind on November 20, 2015 by Brittany. I have not heard of The Name of the Wind before, but it sounds great. As for beer *puts head down and mumbles* I drink Bud Light. But the Salted Caramel Brownie Brown Ale sounds delicious. This is one of the most creative things I have seen lately! Awesome job I love it!